In a bowl combine the tomato sauce and 1 teaspoon red pepper flakes. Spread the mixture over the stretched pizza dough. Top with the sliced mozzarella. Sprinkle the bacon, mushrooms and sliced onion on top. Brush the crust with olive oil and sprinkle with the grated Parmesan. Place the pizza on a baking sheet and bake until the cheese is golden and bubbly, about 10 to 12 minutes. While the pizza is baking, put the arugula, 1 tablespoon olive oil and a sprinkle of kosher salt in a small bowl, and toss to combine. Remove the pizza from the oven. Let cool for 5 minutes then top with the arugula mixture. Slice and serve hot or at room temperature. 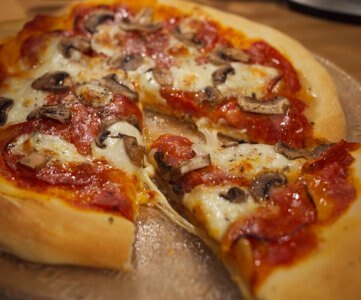 Cook’s Note: Nothing beats a pizza stone for getting the crust as crispy as possible. Head to any department store where kitchen supplies are sold and pick up one. For the best results, preheat the stone in the oven before placing the dough on it.